I have been a big fan of mead (honey wine) for years. Thick and syrupy, drinking mead is like taking in a mouth full of honey. I just love to sip this beverage on a cool spring day! Now, many of you are probably scratching your head wondering why a beer blogger is writing about mead. Well for one thing, I don’t discriminate. And for another, it’s considered by many archeologists and food historians to be the ancestor of all fermented beverages. Dating as far back as 2000 B.C. (and possibly further), mead has been enjoyed in Africa, Asia, Europe, and now the United States. I’m sure you are still wondering why this article even exists. Well, PNW brewing icon Rogue Brewing has taken on the task of creating lovely mead that is not only light and crisp, but easy for even the mead hater to enjoy. 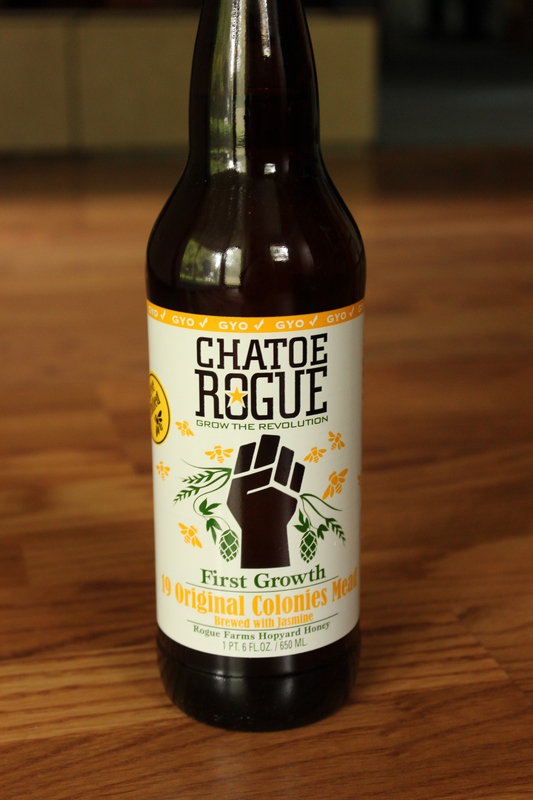 Rogue Farms First Growth 19 Original Colonies Mead is Rogue’s interpretation of a beer drinker’s mead. All I can say is WOW! THIS IS GREAT MEAD! Ok, I’m obviously going to say more. The beautiful color is rivaled by the luscious aroma. Jasmine flowers and honey dominate the nose. Traditional mead is very thick and syrupy with no carbonation what so ever. Rogue, however, uses champagne yeast and free range coastal water creating a lovely, champagne-like carbonation so the body is clean and sparkly but still maintains the jammy qualities of traditional mead. Rogue uses their own Rogue Farms Hopyard honey along with wild flower honey and Jasmine Silver Tip Green Tea Leaves. This mead is delightfully aromatic, crisp & clean. For a wine made with two types of honey, this mead is sweet but not sickening sweet. Jasmine flowers are prominent through the body and mellow out the honey. The green tea adds a nice, soft acidic tone and the finish is just, again, more heavenly jasmine. The ABV is only 5.2% but because this is a bit thicker than beer, I don’t suggest you drink it with food. My husband can’t stand mead, but guess what? He couldn’t get enough of this one! Neither could I!! We actually went back to the bottle shop and bought a couple more bottles. Rogue Brewing got it right.